No more dealing with multiple multi-gigabyte files and confusing installation for MegaSceneryEarth. For each title you purchase from now on, there's now only one tiny download file that you have to work with to install your MegaSceneryEarth scenery. 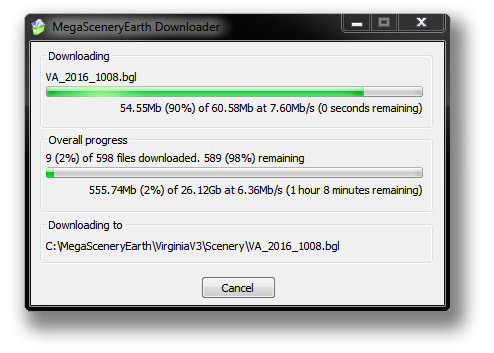 When you complete your purchase, you just click on the small 6 Mb file to launch the installer, respond to a few prompts and the download then happens in the background right from your desktop using our own brand new MegaSceneryEarth Downloader. The process of downloading and installing such large amounts of data that each MegaSceneryEarth state couldn't be easier and more streamlined. You will now be flying your new MegaSceneryEarth purchases with less than 10 quick mouseclicks after the completion of your purchase. No more downloading and unzipping multiple 2 G b files. The small 6 Mb installer and downloader installs the scenery BGLs direct from our server into your install directory on your PC. If you are fortunate enough to have a 1 Gbps fiber connection, you will download most titles in around 5 minutes. A 300 Mbps connection will take around 15 minutes and a 100 Mbps connection around 30 minutes. And if you can't wait to get flying the skies above your new scenery, you can begin flying your scenery while the download continues in the background. The initial release of the installer is being incorporated into all titles now. You can view the list of which titles have the new installer via this link. Most have been upgraded and the entire range will have been upgraded within 14 days of this posting. Future builds of the downloader will incorporate pausing of your download as well as bandwidth control.... so other family members sharing your internet connection don't get mad at you. Your installer for your purchase will always remain in your order history so if you do need to reinstall your scenery, and haven't made an offline backup copy, you only need to go back into your order history control panel to redownload and launch your installer. For those customers who still like traditional media, you can still order backup DVDs and Flash drives to be sent to you by mail. We know that you will appreciate this improvement to our product line.